Will Trump and Kim Meet Again? There are several objective reasons for delaying the summit. One of them is purely technical. It usually takes two or three months to coordinate the necessary security measures. Since Christmas holidays are just around the corner, a more realistic date for the summit is late January or even later. Furthermore, Kim Jong-un is expected to deliver his New Year address on January 1, when he will announce his plans for next year. Japanese newspaper Asahi Shimbun has reported, citing sources in the US administration, that a US-North Korea summit should have been held in mid-November in Stockholm or Geneva. However, the summit was postponed when the planned November meeting between US Secretary of State Mike Pompeo and senior North Korean official Kim Yong Chol was put off until later “when our respective schedules permit,” as the US State Department said. Furthermore, the Washington-based Center for Strategic and International Studies (CSIS) wrote on November 12 that there could be between 13 and 20 undeclared missile operating bases in North Korea. On November 16, the North Korean media reported that Kim Jong-un attended tests of a new high-tech weapon. Will the latter two reports seriously affect the US-North Korea talks and their outcome? Hardly, because the summit was delayed, not cancelled. Washington and Pyongyang did not say that their dialogue is over. Both sides are upping the ante ahead of the potential summit, hinting that their plans could change any day. But all this is part of the bargaining. Both Trump and Kim love to raise the stakes so as to have more bargaining room. Actually, there are several objective reasons for delaying the summit. One of them is purely technical. It usually takes two or three months to coordinate the necessary security measures. Since Christmas holidays are just around the corner, a more realistic date for the summit is late January or even later. Furthermore, Kim Jong-un is expected to deliver his New Year address on January 1, when he will announce his plans for next year. Since the inter-Korean détente began with such an address in 2018, the date and agenda of the Trump-Kim summit will likely depend on the essence and tone of the North Korean leader’s 2019 address. The second reason is that the planned summit should produce a result which both sides can interpret as their victory. But there are few possible compromises that will not affect North Korea’s defense capability. The first Trump-Kim summit was a trial balloon floated to map out the framework of possible interaction. The next meeting should focus on practical action. 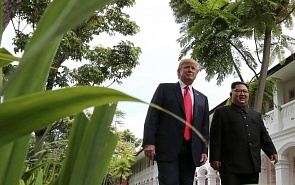 The results of the midterm elections in the United States protected President Trump from impeachment, whereas clear concessions to North Korea, or what his opponents view as concessions, could deliver a blow at his reputation. What cards can Trump and Kim deal out? The situation when sanctions prevent North Korean missile tests suits Trump. At best, the two leaders can sign a joint declaration declaring an end to the Korean War, but they are unlikely to sign any binding document because a peace treaty with North Korea would be a really serious concession. In reply, Kim may agree to tear down the Sohae range and allow international inspectors to visit Sohae and the Punggye-ri nuclear testing site to see if the destruction is irreversible and the test tunnels are totally destroyed rather than walled in, leaving the infrastructure inside untouched. However, Kim had promised this during Mike Pompeo’s visit to North Korea. There must be new issues for discussion at the Trump-Kim summit. ﻿The visit of the US Secretary of State to the DPRK took place at the second attempt: Pompeo was going to Pyongyang last summer, but his August visit was cancelled. The US Secretary of State was expected to persuade Pyongyang to provide a specific denuclearization timetable, and in response Washington would announce the end of the Korean War. However, in July, in response to a timetable request, the North Korean side declared that it was necessary to formally end the state of war between the two countries, and only after that talk about denuclearization. Kim Jong-un could submit a list of North Korea’s nuclear facilities or the number of bombs and missiles it has. This would launch another round of bargaining but it will not allay the suspicions that Pyongyang is keeping some of its facilities undisclosed. The United States will also demand that IAEA inspections be allowed to visit the declared facilities. This bureaucratic wrangle can draw out the dialogue for six to 12 months, while Trump will brag about making progress. The third reason for delaying the summit is that Trump depends on public opinion, which his opponents are trying to turn against him, more than Kim does. Trump’s opponents include both the Democrats, who want Trump to fail and do not care if this damages the country, and the classical Conservatives, some of whom see North Korea as an evil country cooperating with which is ideologically unacceptable. Every time minor progress can be made in the Washington-Pyongyang dialogue, the anti-Trump media accuse North Korea of lying. This is the gist of the November 12 report about North Korea’s “undeclared missile operating bases.” Experts soon said that these are intermediate- and shorter range missiles, that the report was based on satellite images made in March 2018, while the US-North Korea summit was held in June, and that Kim never promised to destroy these facilities or even disclose their number or purpose. But the target of the media was not Kim but Trump, who was portrayed as a foolish leader who can be led by the nose. And lastly, the date of the summit is not important for Russia or the inter-Korean dialogue. The speed of the process is not as important as the direction in which it is moving. As long as the sides speak about denuclearization, the situation on the Korean Peninsula can be described as the “double freeze” or “double suspension,” which Russia and China proposed. The processes Russia and the rest of the world see as alarming have been put on hold, which is a minor victory. This is good, considering that a complete victory is highly unlikely.